There was a time when Vilma Santos was Mayor of Lipa City when the Bore Question of the Year that we Lipeños invariably had to answer whenever we visited other cities was. “Kamusta si Ate Vi?” (How is Ate Vi?) Yes, as though everyone in the city rubbed shoulders with her just to pass the time. And of course, knowing as I did that my former student Darell Macatangay is at Microsoft, despite knowing that I was asking another Bore Question of the Year, I could not resist the temptation to ask if he has met Bill Gates. “I have not met Bill Gates personally,” Darell confesses. Oh. Pity! Albeit, this was exactly how they would react whenever we said that we were not exactly in Ate Vi’s circle of confidantes. But I have jumped ahead of the plot like a Jason Bourne story. 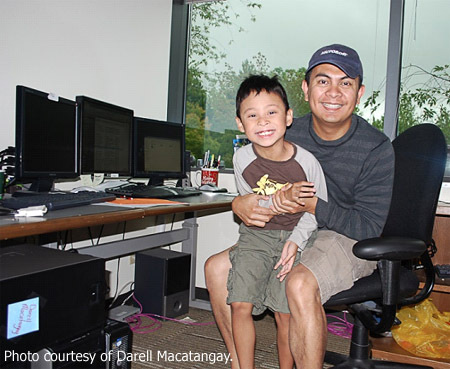 Allow me to properly introduce you to Darell Macatangay, currently managing a team of Software Developer Engineers in Test or SDET’s for MS Office’s online offerings at Microsoft’s Headquarters at Redmond in the State of Washington. Darell is from the high school class of 1991 and was also in my History class. I also vaguely recall that he tried out for my team but only stayed for a couple of weeks; probably even less. With his dark good looks and debonair charm unusual for a high school kid, it was perhaps best that he chased after ladies rather than footballs. He also recalls the Y2K scare that companies the world over had to contend with and how it ensured that there would be no scarcity of computing projects. 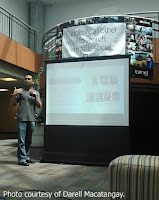 “My major project was automating the Disability and Retirement Claims process of the Social Security System,” Darell says. His reminiscing is also accompanied by a bit of irony. Despite a promising career at Unisys, at the turn of the millennium Darell decided to seek greener pastures by migrating to the United States. The Internet was becoming a truly global phenomenon and American companies were in a mad rush to hire tech-savvy employees from abroad to take advantage of this. Darell moved to the United States in April 2000. He was initially based in San Ramon, half-an-hour’s drive from San Francisco in the Bay Area. Cotelligent shouldered his living expenses until he got his first client, which did not take long. 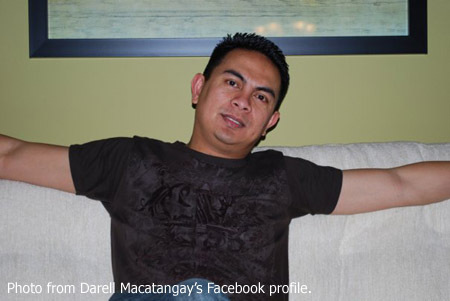 Fortunately for Darell, Cotelligent pulled him from off the account because of non-payment. The experience was three months too long, but it also taught Darell a thing or two about himself and life in a different country. 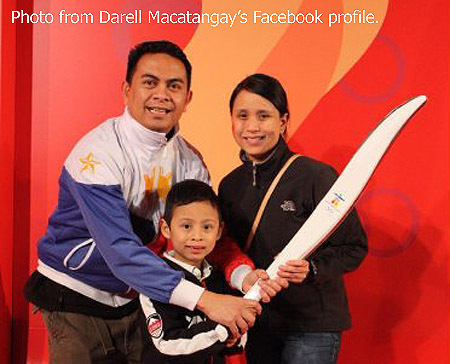 In 2003, Darell moved to Bank of America; but this time as a full-time employee. He was hired as a developer and worked on the bank’s Loan Applications System using Microsoft’s emerging technologies like C-Sharp, WebServices and Dot-Net. He only stayed with the bank for a mere two years; but the financial rewards and the work environment were more than what he hoped for that he actually felt secure in the job. 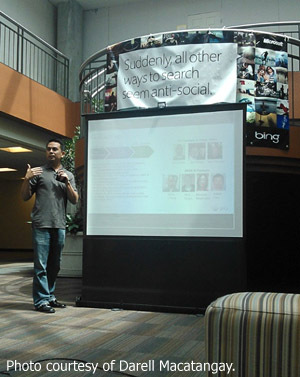 “I remember telling my wife that I would not switch jobs unless it was Microsoft,” Darell recalls. He had taken four exams to become a Microsoft Certified Developer and was obviously enamoured with the technology of the world-renowned company; but little did he know that his own words would be prophetic. The ultimate challenge to becoming a Microsoftee – as employees of the company call themselves – was, however, in trying to get in. Hundreds of résumés were being screened by the company for each job opening and only the best were called in for interviews. But get in, Darell did! 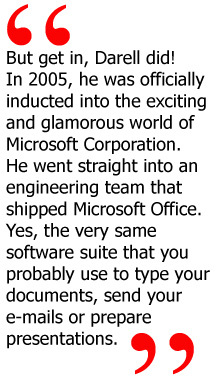 In 2005, he was officially inducted into the exciting and glamorous world of Microsoft Corporation. He went straight into an engineering team that shipped Microsoft Office. Yes, the very same software suite that you probably use to type your documents, send your e-mails or prepare presentations.